The other day I was driving down the street, when a large feather from a rusty white truck transporting turkeys blew into my Jeep window. After I pulled over, I held the turkey feather in my hand and a single tear cascaded down my cheek. I looked up into the setting sun and thought about a time when turkeys must have walked around our world free of all fear. A time when turkey families used to gather around their little turkey dinner tables and gobble about the turkey dad’s day at the office or the turkey kid’s day at school. When I got home, I placed the turkey feather in an ornate vase on the mantle of my fireplace as a tribute to our fallen feathered friends. As I bent down to pick up my Xbox 360 controller, the feather floated off my mantle (maybe on the breath of God?) and landed directly on top of one of my videogame consoles. And then it hit me. The turkey feather was trying to tell me something. The way the light danced around the frayed ends of the feather -- the way its shadow formed a specific gray shape on the matted white top of my console. Of course! All the turkeys of the world were communicating to me through this mystical feather sent from fate herself to tell me their torturous tale. 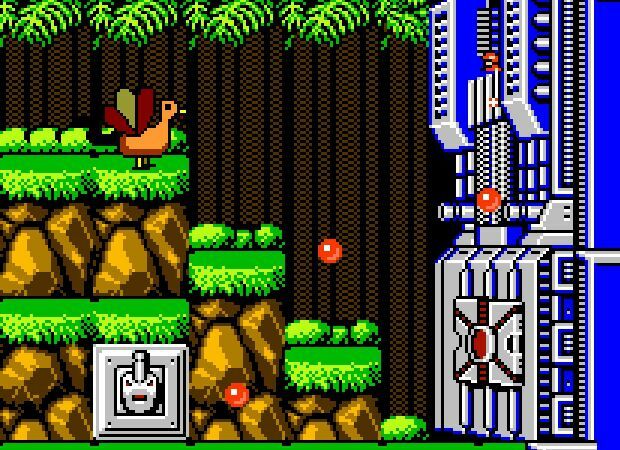 A terrible tale about how turkeys of the world have been viciously portrayed in videogames over the years. Hit the jump to hear their tragic story. In the beginning, things started off very promising. The year was 1982. The Atari 2600 was the hot, new system. Not many animals had been asked to star in videogames, but, with Eggomania, everything changed. A turkey was the main character, tasked with dropping green eggs into a plate being held by a blue bear. 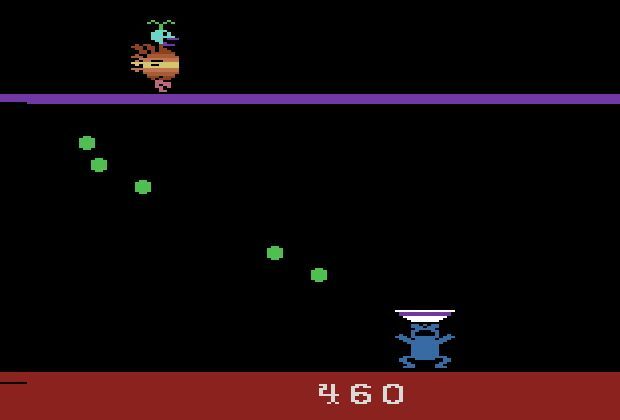 Sure, Eggomania ended up being one of the most horrible games ever released on the 2600, but at least a turkey was the star. As you will read in the rest of this sad tale, the turkey’s videogame future is not nearly as bright. This was their one and only moment to shine -- to stand in the spotlight next to such other Atari 2600 stars like E.T. and the square pixel from Adventure. It was a glorious moment that, like so many other early stars, ended in a fall from grace. Oh, and please don’t bring up the fact that the “turkey” from Eggomania may not even be, in fact, a turkey. The turkeys of the world have enough of a hard time dealing with everyday life. Don’t you dare ruin this one moment of past glory for them. After receiving their surprisingly healthy residual check for selling exactly three copies of Eggomania, videogame turkeys were on top of the world! They could conquer anything! Who knows? 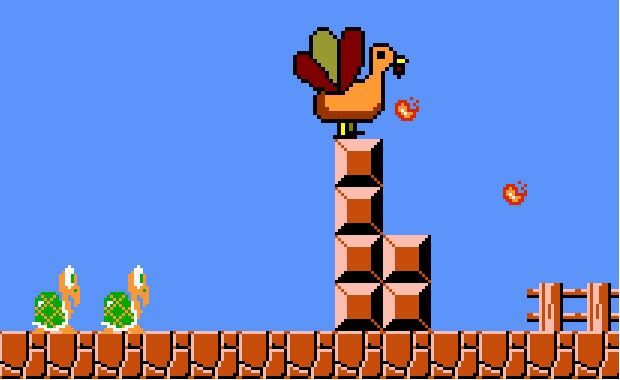 Maybe turkeys would be the stars of every videogame from now on! Sadly, this could not have been farther from the truth. 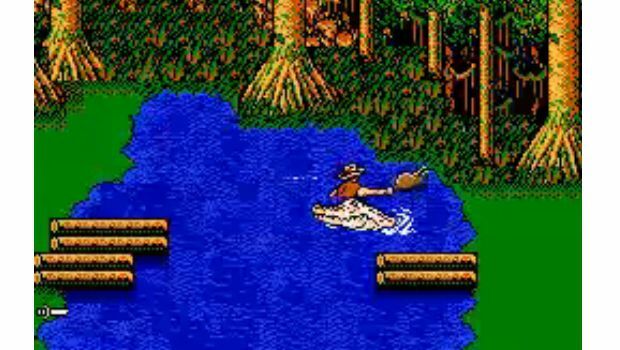 After years of not being featured at all, the poor turkeys of the world received one glimpse of hope when they heard they would be featured in The Adventures of Bayou Billy for the Nintendo Entertainment System! This was their comeback! 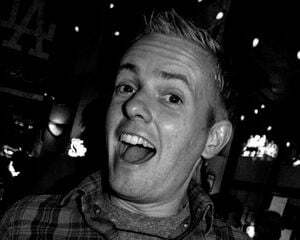 Enthused gobbles echoed throughout the world. And then the sad reality hit. A sad reality that would rear its ugly head in beat 'em ups for years to come. Instead of Bayou Billy fighting alongside a poultry partner (that would have been AWESOME! 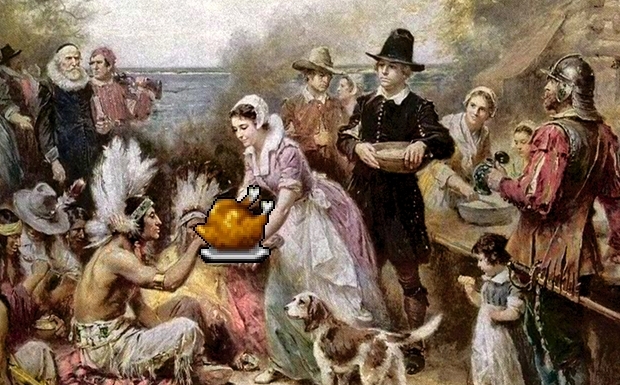 ), the titular hero would ... eat cooked turkeys to regain health. That’s right. After punching random enemies, a dead turkey would pop out of their bloody corpses and Mr. Billy -- the classy, respectful guy that he is -- would devour the meat to boost his energy. Then there was Final Fight. This time, when playable character Guy broke open random crates and oil drums, dead turkeys were there to help refill his health. And, seriously, what were they even doing in an oil drum? And already cooked? Who even cooked them?! AND WHY WOULD THEY JUST LEAVE THEM IN AN OIL DRUM? The lack of realism destroyed any self-esteem the turkeys had left. 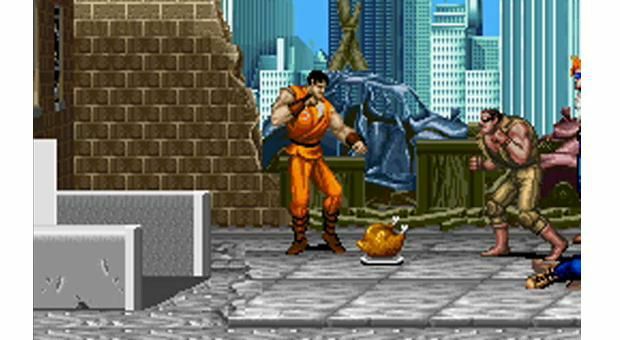 This use of turkeys as energy replenishers continued in many more brawlers for years to come. Et tu, Castle Crashers? Et ... tu? At this point, most of the “lucky” turkeys that avoided being Thanksgiving dinner had either committed suicide or taken to a sad life on the street. After finally dealing with being nothing more than glorified videogame health packs, things in the industry took an even more tragic turn. At first, the remaining sane turkeys had reason to rejoice. 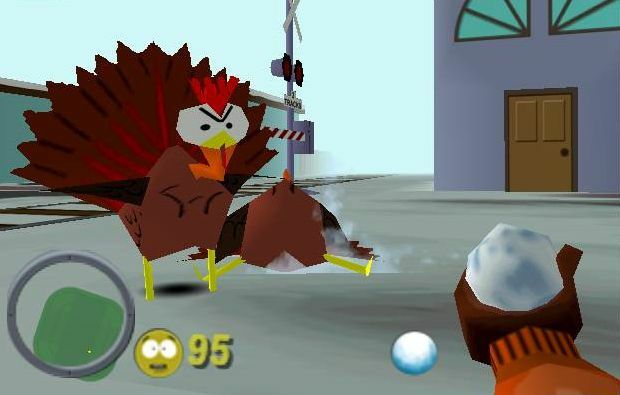 It was 1998, and hot new show South Park was holding open auditions for alive turkeys to star in their first Nintendo 64 game. Was their almost bigoted portrayal finally going to come to an end? As you can see, although turkeys were once again asked to star in a videogame, their return to the spotlight was not what the poor turkeys were expecting. Instead of rescuing a princess or saving the world from an evil mastermind, they were reduced to being pelted by frozen snowballs. But snowballs are, technically, what little kids play with, right? Maybe the creators of the South Park game were using turkeys as a metaphor for lost childhood. That would be so Shakespearean! Grand Slam Turkey Hunt for the PC. It doesn’t take much explaining, but in the game you basically do nothing more than shoot realistic-looking turkeys in the face. That’s pretty much all there is to it. You pick up a gun, take the time to aim it, willingly pull the trigger, and blow the feathers (and souls!) off a helpless turkey just wandering through a field, smiling, and whistling a happy song from some turkey-themed musical whose name escapes me at the moment. At least in Final Fight or South Park there was some kind of plot! 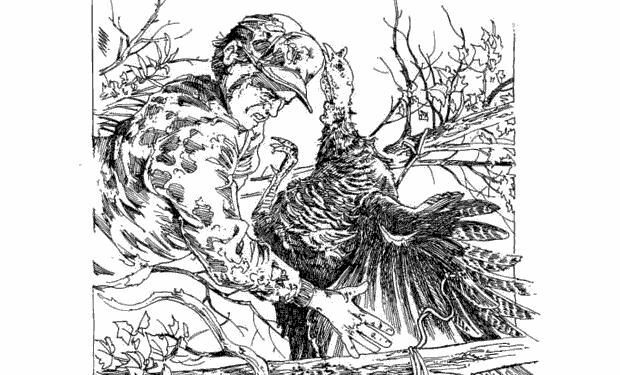 Grand Slam Turkey Hunt amounted to nothing more than a snuff videogame. After everything -- after years of devastation and depression -- seemingly creature-friendly LittleBigPlanet for the PlayStation 3 managed to humiliate the turkeys of the world with one final insult that took everything over the edge. Not only is the turkey dead, he is not even cooked. He is just a raw carcass, one that would not be tasty in the least. One that would even most likely give you Salmonella! And the Sackboy just sticks his head in ... there, like it is some fun costume! Can you imagine if someone just stuck their head inside your dead grandmother and paraded her around like she was a party favor? It is ridiculously insulting. With this, the turkey’s tale came to an end. It took a lot out of me to voice this tragic story to you -- my heart could almost not take it. 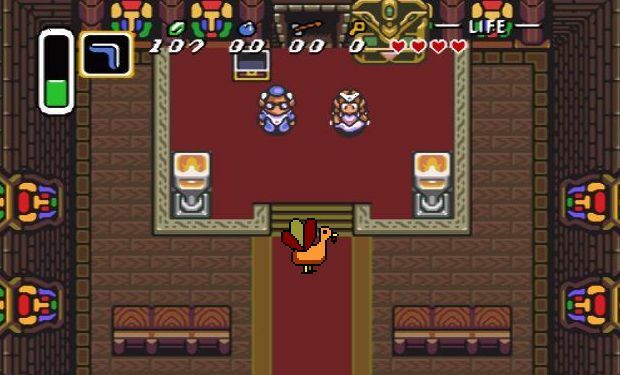 After years of videogame abuse, the poor turkeys of the world have done their best to appear loyal and happy. They have kept their gobbles strong and proud. They have held those little dangling things under their beaks high. 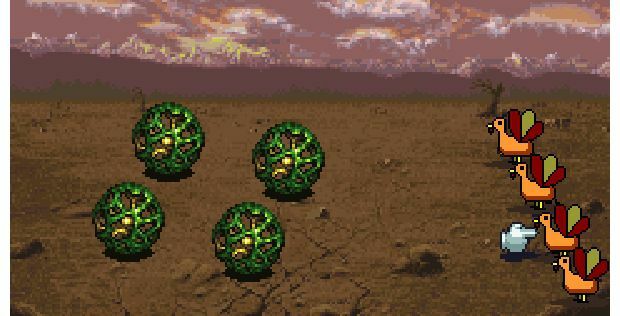 All they have ever wanted is for just one videogame to portray them in a positive, heroic light. Well, you know what, turkeys?! After hearing your history, I am going to change everything! Today is already a rough day for you -- what, with all the mass murders and all -- but try to forget about that and focus on the below images. Rejoice, turkeys! I am with you! I will stand up and tell the world your story! I am horrified and disgusted by how you have been portrayed in videogames over the years! It is not right! You have gobbled your last sad gobble. From here on out, YOU are the future of videogames! YOU are the stars of tomorrow! ... okay, the turkey cooking in my oven right now smells really good. I ... uh ... I’ve got to go. Good luck, turkeys. Happy Thanksgiving!